The mysteries of Greek mythology are milked to death by Rick Riordan…in a good way. After the pop cultural success of Percy Jackson, here’s a first serving of another series, kind of like a Greek myth adventure spin-off as we are introduced to a new and interesting triad offspring of gods. How does a pretty boy with amnesia, a beautiful, hopeless romantic Native American ‘celebrity’ daughter, and a funny Mexican machine/fire whiz sound to you? Jason Grace, Piper McLean, and Leo Valdez take the readers into another exciting quest as they face entities more ancient than their godly parents. As they discover their lineage in Camp Half-Blood, their fates unravel before them, shaking their souls when they learned that they are instruments to a prophecy that will end in a battle between gods and humans. 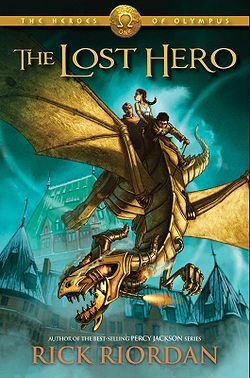 In comparison to the Percy Jackson narrative, this new series managed to develop the stories of all 3 protagonists equally. It’s a nice change for the pretty boy hero to kinda take a backseat and have his sidekicks eat their cake too (Leo rocks). You don’t have just one or two perspectives…there are three coming-of-age stories weaved together. It’s ambitious of Riordan to keep up 3 tales without one eclipsing the other, but since it’s open-ended to serve as teasers to the next journeys, the next books are expected will answer this fear. Surprisingly, the book’s title is off-tangent from the main plot. How puzzling could that be? It would spoil the readers if I divulge my thoughts on this, but if you’re thinking if it’s connected to Percy Jackson, the answer is a big YES.